KDTX Composite Reflectivity 10:19pm EDT June 24 2013. Plus signs indicate lightning. 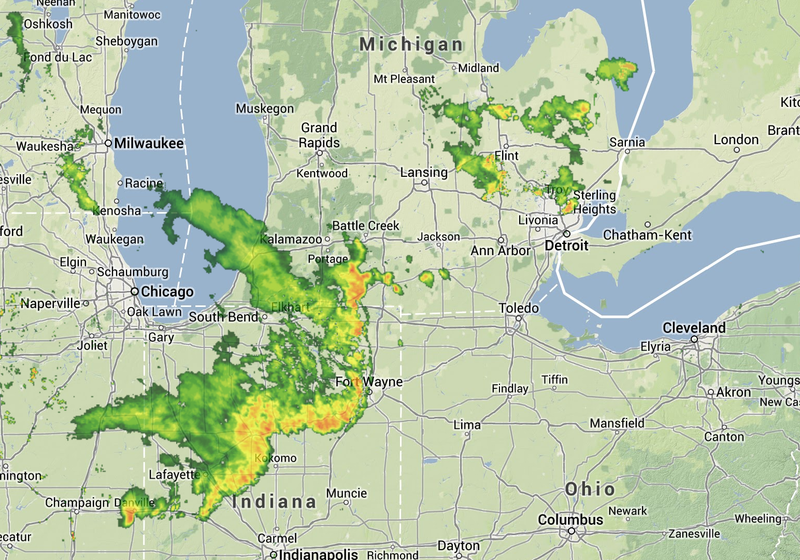 The storm system that swept across northern Indiana late this afternoon/early this evening is moving our way, and while Ann Arbor is not under a severe thunderstorm watch, some strong storms currently south/southwest of Jackson are headed our way. These storms have weakened somewhat in the last two hours and are not severe, but are expected to bring 40+mph winds, brief moderate downpours, and occasional lightning, so the usual storm safety advice applies: best to be indoors. CHELSEA TO 19 MILES SOUTHWEST OF HUDSON...MOVING EAST AT 45 MPH. BRIEF MODERATE DOWNPOURS...ARE POSSIBLE WITH THESE STORMS. SHELTER IN A STURDY STRUCTURE UNTIL THESE STORMS HAVE PASSED. A severe system responsible for several severe thunderstorm warnings (mostly due to long swaths of damaging winds) in eastern IL and across northern IN is weakening, but continues moving across the upper midwest at 35-45mph. The current severe thunderstorm watch (WW358), in effect until midnight for northern IN and SW/south central MI, may be extended to include SE MI depending on how the storm develops or weakens over the next half hour or so. The system appears to be weakening now, and will continue as temperatures cool; it’s a question of how quickly the system weakens. Additionally, a new thunderstorm outlook issued at 9:10pm EDT, effective through 8am Tuesday, places us squarely in the 40% probability area for thunderstorms. 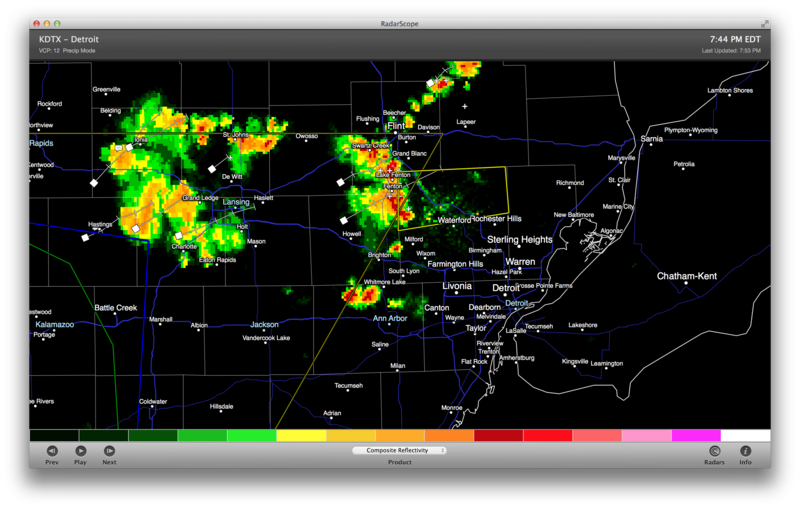 The primary threat from these storms will be damaging wind. We have a 15-30% chance of damaging wind through 8am Tuesday, along with a 5% risk of hail, and a very small tornado risk. NWS Detroit has prepared a briefing on the severe weather threat facing SE Michigan tomorrow (Tuesday) and Wednesday. KDTX Composite Reflectivity June 24, 2013 7:44pm. Bright yellow box in northern Oakland County is a severe thunderstorm warning; plus signs indicate lightning. For now, at least, these summer thunderstorms are just north of downtown Ann Arbor, extending north past Flint and west past Lansing. These storms developed relatively quickly late this afternoon, and we can expect development to continue into the evening as the air cools. Looking forward, we can expect thunderstorms across the area Tuesday morning. (The SPC puts us in the 40% probability area for thunderstorms from midnight through Tuesday morning.) Some of these storms will be severe, with the primary threats being damaging wind, large hail, and brief heavy downpours. As on any hot, humid summer day, we can expect thunderstorms to develop across SE Michigan and northern Ohio today. 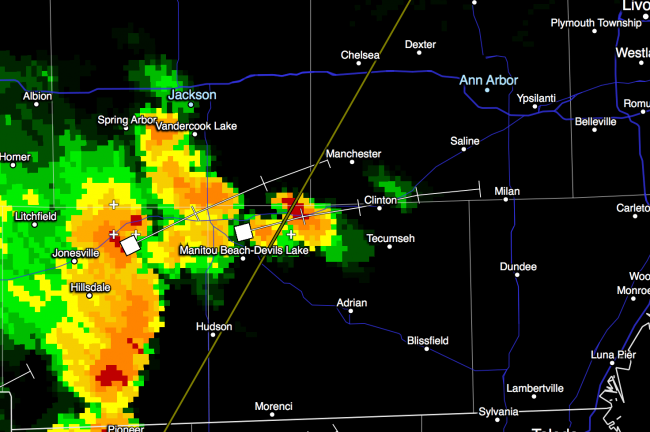 It is difficult to predict accurately & specifically whether any will hit an area as small as Ann Arbor. Severe weather is not generally expected, but isolated thunderstorms could be strong, with 50-60 mph wind gusts and briefly heavy rainfall. EAST BETWEEN 15 AND 20 KNOTS. 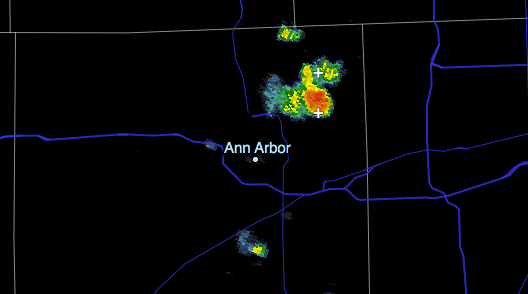 As of 1:20 pm, a small cell has popped up just north of Ann Arbor; this cell is tracking east-northeast and will continue to develop while moving away from the city. We can expect similar pop-up thunderstorms across the area this afternoon. The SPC puts us at 10%-30% probability of thunderstorms until midnight; and only a 5% probability of damaging wind or large hail.